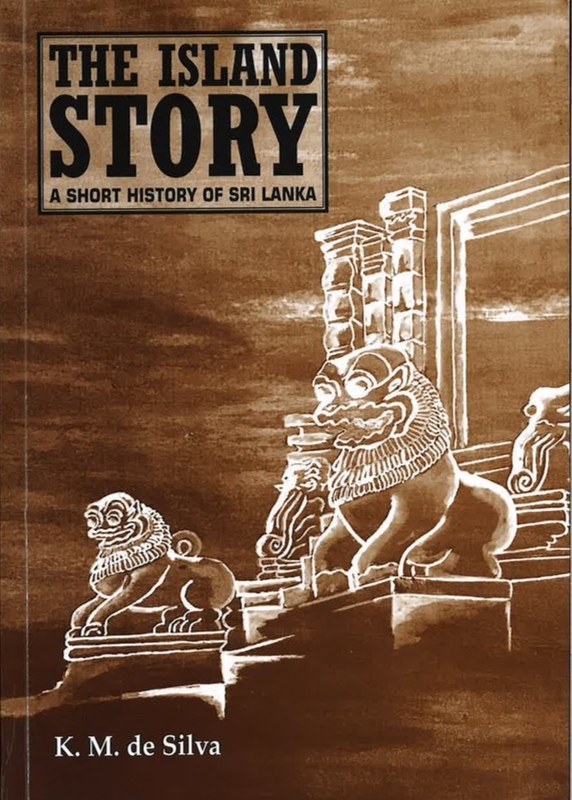 Book Review: K. M de Silva, The Island Story: A Short History of Sri Lanka, International Centre for Ethnic Studies, Kandy, Sri Lanka, 2017. It’s said that fools rush in where the wise fear even to walk. I tiptoe hesitantly, conscious that I am no historian (my discipline was Literature) while the author is perhaps the most eminent of Sri Lankan historians writing in English. The hope is that what I write will be taken as a layman’s perspective and contribution to discussion. In the struggle between Sinhalese Dutthagamini and Tamil Elara (so falsely and injuriously celebrated in the Mahavamsa) there were “large reserves of support for Elara among the Sinhalese” (de Silva, page 12), and his victory was not, as it is now seen, one of Aryan triumph over the Dravidians. (Interestingly, it was the Tamil rulers who were known as Arya Chakravartis: page 26. “Arya” meant noble or excellent.) There seems not to have been then, as now, an overriding Sinhalese consciousness: for example, Dravidian assistance was called upon to settle differences within the Island (page 20). Nor did the Island hesitate to send troops to (what is now known as) India: see page 15. These and other statements are likely to arouse the ire of Sinhalese nationalists (racists invariably describe themselves as “nationalists”). Nor will comments such as the following endear him to them: “In 1739 the dynasty established by Vimala Dharma Suriya became extinct in the male line, and the South Indian Nayakkar dynasty came to the Kandyan throne by virtue of marriage alliances with the ruling house in Kandy” (p. 44). But this did not lead to any substantial change because the Nayakkars “became more Kandyan than the Kandyans”. Under their patronage, there was a great Buddhist revival “and this had its influence on the low country as well” (ibid). About one-third of the book consists of events leading up to the internecine conflict, an ugly war in a beautiful island – “beautiful” geographically. It is now almost a cliché that History is written, preserved and passed down by the victors. (And not only through history books but also through other media such as fiction, orally transmitted stories, songs and films.) Secondly, there is the question of objectivity, something easier for the scientist to achieve than for those in the Humanities. As Heidegger commented, even objectivity is judged by a subjective self. (I am aware, and fully accept, that I’m no exception.) Yet another human trait is that we prefer, and are more comfortable with, clear and simple categories: black and white; bad and good. Varying shades of grey are problematic, even vexing. I must say I found this third part of the book a disappointment. Professor de Silva writes (pp. 99-100) that separatist agitation began with peaceful political pressure in the mid-1950s. The phrase, “separatist agitation” occurs elsewhere as well in the book but, far from wanting separation, Tamils for long rejected even federalism. As I wrote in Volume 2 of my Public Writings on Sri Lanka (page 59): “In 1952, the Kankesuntharai parliamentary seat was contested by Chelvanayagam, as a member of the Federal Party. He was comfortably defeated by a U.N.P. candidate.” See also, op. cit., page 58: “Even after the trauma of Standardisation (“racial” quota) in relation to University admission beginning in 1971, and the Draft Constitution of 1972, the All Ceylon Tamil Conference declared, ‘Our children and our children’s children should be able to say, with one voice, Lanka is our great motherland, and we are one people from shore to shore. We speak two noble languages, but with one voice’”. The author writes of “the pathology of separation” (p. 137). The word “pathology” is derived from “disease” but there’s a failure to ‘connect the dots’ he himself has provided; a failure to perceive cause and effect. I cite a few of the former. The language policy proclaimed prior to independence was, post-independence, “unilaterally repudiated” (p. 105). The new constitution of 1972 was “the consolidation of the linguistic nationalism that had dominated Sri Lankan politics since 1956” (p. 108). The “landmark general election of 1956 was the beginning of Sri Lanka’s fall from grace. Ethnic harmony was replaced by ethnic conflict” (p. 105), marked by a succession of riots. (Riots imply rioters but there’s no need to specify who the rioters were and who the victims.) The introduction of a racial quota in the 1970s meant that “academic ability per se no longer sufficed to ensure entry to the university” (p. 113). ‘Affirmative action’ is usually understood as measures taken to help minority, disadvantaged, groups. But in Sri Lanka, it means further favouring the majority and disadvantaging minority groups: see, page 114. As William Ralph Inge (1860-1954; Professor of Divinity, Cambridge; Dean of St Paul’s) commented, historians have a power which not even God has: that of altering the past. The past (which conditions the present and shapes the future) is not inviolate; can be misinterpreted, distorted. In large part, this is because the majority of us, human beings, believe what we wish and want to believe. One could say; First comes the conviction – however vague or concrete – and then the (alleged) evidence. Arriving shortly after the anti-Tamil pogrom of July 1983, Naipaul was horrified and revolted by what he learnt: a young boy hacked to “limbless death”. Murderers, looters and incendiarists “often had to rely on the information derived from the electoral registers…Their blood-lust was, in effect, regulated by the bureaucratic endeavours of the Civil Service. Before the axes could be wielded, before the petrol bombs could be thrown, before the pillaging could begin, a little paperwork was necessary”. Here, as elsewhere, the writer’s anger and indignation pulse beneath the urbane, seemingly detached, ironic tone. Of two Tamil sisters, aged about eleven and eighteen, the younger one has her head chopped off; the elder one is stripped naked, and when “there were no more volunteers, when there was nothing worth the violating, petrol was poured over the two bodies”, and they were set alight. As a critic has commented, group-animosity was symbolic for Naipaul of the hatred that arises when a people’s otherness isn’t freely granted. Impeccably wrought and morally charged, Naipaul’s essays are a testament to his generous humaneness (Public Writings on Sri Lanka, Volume 111, pages 19-20). Immediately after July 1983, Tamils occupied the moral high-ground and there was international outrage on their behalf, but the actions of the Tigers quickly turned strong sympathy to acute antipathy. For this phase of the war, I would suggest Paul Moorcraft’s ‘Total Destruction of the Tamil Tigers: The Rare Victory of Sri Lanka’s Long War’, 2012. Professor Moorcraft has written several books on recent wars. His Total Destruction is short but contains a wealth of information and detail. The author has read on Sri Lanka, visited sites, and conducted interviews including with army commanders, the Permanent Secretary (Defence), the President, Kumaran Pathmanathan (“K.P.”), Colonel Karuna and others: see, Sarvan, Colombo Telegraph, 9 June 2013. For a study published in 2017, Island Story makes no mention of the final phase of the war, and the maiming and killing of thousands of children, women and men. The Tigers had corralled civilians, desperately hoping their presence would deter the army. Having set out as liberators, they ended as those willing to sacrifice their own on a calculation that was at once selfish and cruel. (No doubt, some will be incensed at me for this statement but those who lack the honesty and courage to acknowledge mistakes, crimes and “sins” have no moral right to criticise and condemn others.) 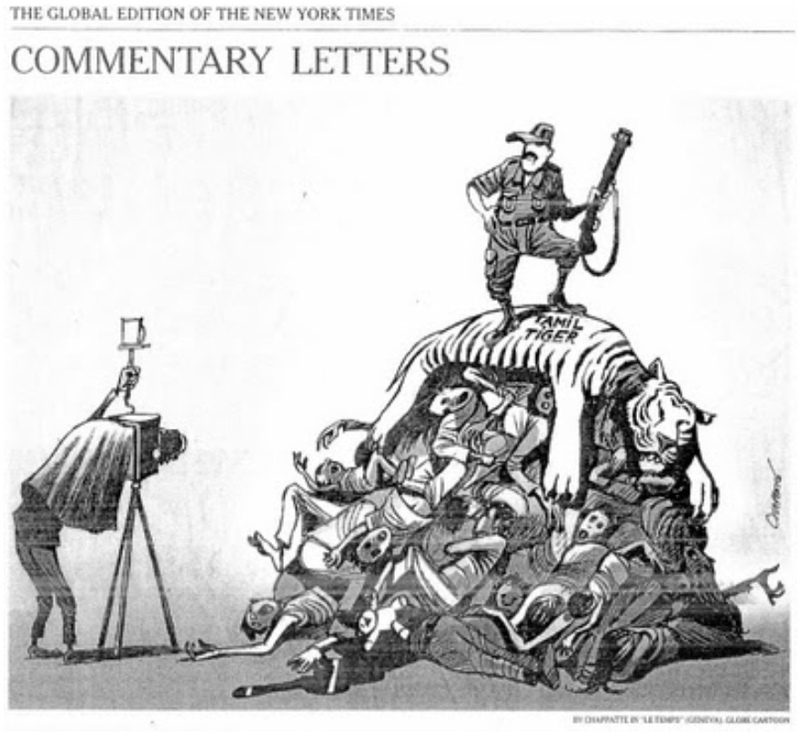 The Tigers’ major miscalculation on the one hand, and the army’s “Go to hell” policy on the other led to a carnage massive in scale and pitiful in nature, succinctly conveyed in this New York Times cartoon reproduced below. Words from the poem, ‘Elegy written in a country churchyard’ come to mind: to wade through slaughter [to victory] and “shut the gates of mercy on mankind”. And what of post-war Sri Lanka? As I have written elsewhere, peace is of two kinds. ‘Negative peace’ is absence, the absence of overt conflict; positive peace is presence, the presence of harmony which, in turn, is the product of justice. (And it is the notion of “fairness” that leads to principles of justice: see John Rawls, A Theory of Justice.) To what extent, if any, positive peace prevails in Sri Lanka is for those with far better knowledge to judge and comment on. Professor K. M. de Silva has compressed wide scholarship, conducted over many years, into a compact work, a book he surely will not wish to see “swallowed” uncritically but, on the contrary, to be engaged with. His is a story of the Island. As evidence increases and perspectives alter, there will be other voices, other histories: no doubt, the author will welcome them. Posted May 10th, 2018 .